The 29th took five weeks to reach St. Lo. Just before the final drive captured the city Maj. Thomas Howie, commander of the 3d Battalion, 116th Infantry, promised his men "I'll see you St. Lo." 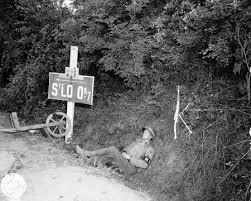 He was killed shortly afterwards but General Gerhardt ordered the division to carry his body on the hood of a Jeep into the town square, and to be the first american into St Lo. His body was then placed on the rubble of the St. Croix cathedral. A New York Times correspondent's story of the incident immortalized the "Major of St. Lo." The division's Task Force Cota, a strike team led by the assistant division commander, Brig. 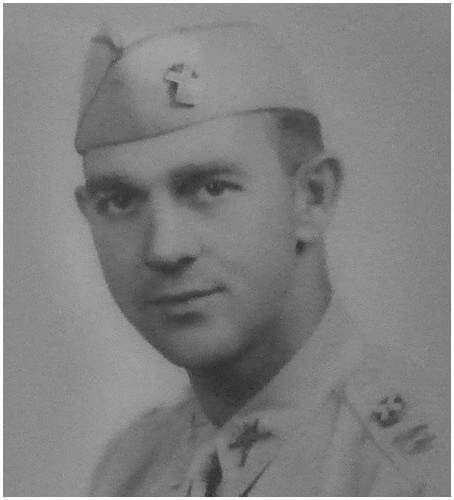 Gen. Norman Cota, finally gained the objective and raised the division flag over the rubble before all the fighting ceased. The Blue and Grey's attack continued on to Vire in late July where the 1st Battalion, 116th Infantry won a Presidential Unit Citation for its role in the capture of Hill 219. The Allies' need for ports to sustain the invasion led to the 29th's next assignment. Trucks shifted the division south to Brest where a bypassed German garrison was stubbornly fighting to protect a submarine base. Siege operations reminiscent of the battles of Yorktown and Petersburg started on 24 August and ran until 18 September when the battered garrison finally surrendered. The men of the Blue and Gray deserved a rest, but after only six days they moved by train across France and Belgium to a part of Holland near the German border.